MINNKOTA Tackle is located in Madison, MN, a small town in Western, MN. It started out as a hobby in 2010 and we now sell spinners and jigs all over the United States. Pete McGinty custom builds spinner rigs, starting with tying snells, then stringing beads, to custom painting the blades. The same goes for our variety of jig styles, all are poured by hand and custom painted in house by Dave Fernholz. In addition to that, we offer custom painted ice jigging spoons, ice tick jigs, glow body jigs, drop gap jigs and protective rod sleeves. If you have something in mind that we don't offer, call or email us and we will do what we can to accomodate you. At MINNKOTA Tackle we strive to provide the highest quality spinner rigs and jigs that we can. We use only the highest quality components and are continually updating and searching for the best product available. We are avid anglers who put these spinners and jigs to the test on many different lakes throughout MN, SD and Canada. Our spinners and jigs are tournament tested as well. We take pride in providing our customers with the best service we can, from creating spinners to their specifications, to fast shipping and simply answering questions regarding fishing in general. "LOVE the GOLD series! GREAT WALLEYE RIGS!" "Great Rigs ... Just Bought 20 more!!!!" "Awesome customer service and fast shipping." "Quality line, hooks and service." will have more orders. Thanks." "This was our first trip out running only your tackle!!!! ​ site to several. Great job." 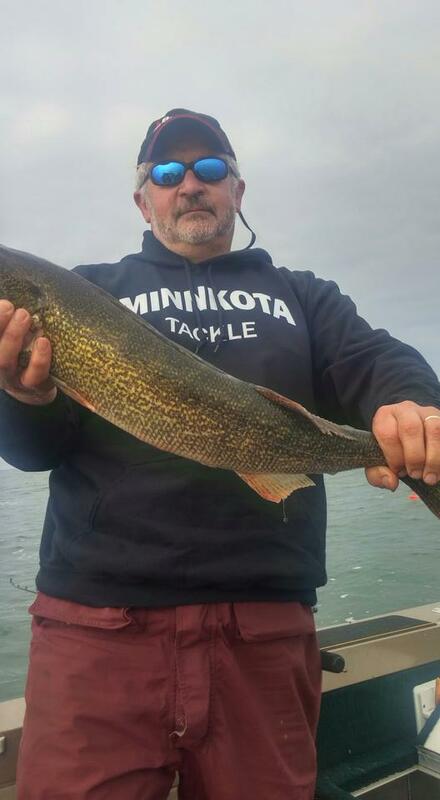 Scott Fernholz of Sartell, MN and his son Sam a.k.a "Net-Man" with a nice batch of North East South Dakota walleyes caught pulling MINNKOTA Tackle spinners and a minnow. Shannon Larson, Dawson, MN, with a nice North Country Eye caught on a "Golden Eye" and leech combination. Vern Brink, Grand Rapids, Michigan, with another dandy walleye got pulling MinnKota Spinners on Saginaw Bay.